For the fourth year, the University of Latvia in collaboration with the Latvian Language Agency organizes “Summer School of Latvian Language and Culture” for students and everyone who wants not only to learn or improve their Latvian language skills, but also to expand their knowledge of Latvian history, art and folklore. 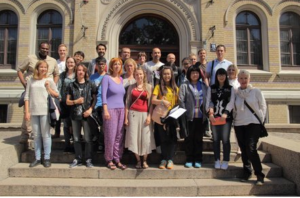 a two-day trip to port city Ventspils, sightseeing.The attendees, having successfully completed the course, are awarded 4 credits (6 ECTS). 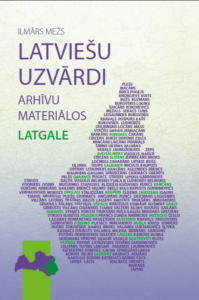 The Latvian Language Agency has published a new book: the dictionary “Latvian surnames in archival sources: Latgale”, developed by the historian, geographer and demographer Ilmārs Mežs. On January 19, 2018 the Livonian culture, language and history web portal www.livones.net met its readers in an updated and modern form. This was a tribute – in the Livonian culture centre (Līvõ Kultūr sidām) – for the most active Livonian culture representative and native speaker in the second half of the twentieth century Paulīne Kļaviņa’s 100th jubilee. The website, which has been working since 2006, is the only one portal in Latvia available online that is related to Livonian topics. On it still can be found detailed information about the Livonians, their culture, language, history, and the Livonian heritage in Latvia. The content can be read not only in Latvian, but also in English and Livonian languages. The updated portal www.livones.net has been supplied not only with a new visual layout, but is also supplemented with various important new sections. The most important of them is lingua.livones.net – a section that provides various tools connected to the Livonian language that could be used both by readers showing interest in the Livonian language, and by researchers from all over the world. 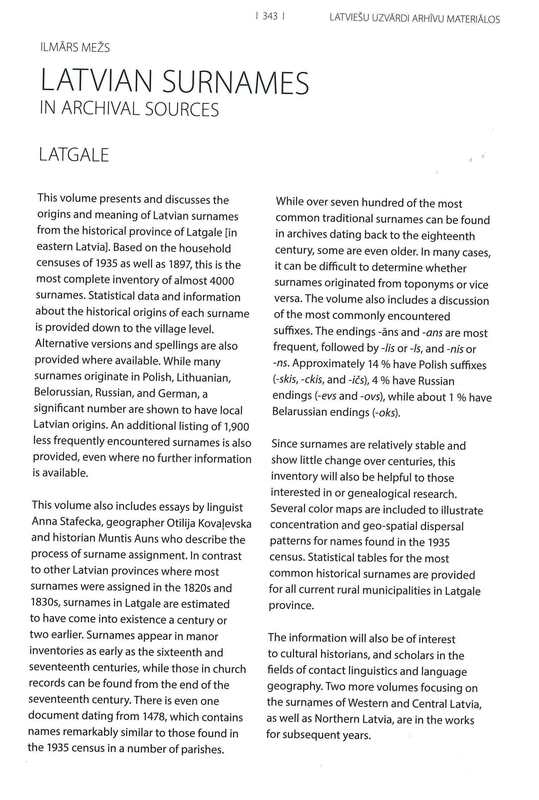 In the section could be found studies about the Livonian language, as well as a constantly updated version of a Livonian-Estonian-Latvian dictionary supplemented with word forms and data from the Livonian language corpus. Available are also the Livonian place name register, a list of borrowings from Livonian into Latvian language, and other tools for getting acquainted with the Livonian language and acquiring it. The new section of the portal will be gradually filled in with the University of Tartu’s upcoming Livonian language grammar this very year. The second most important section is “Library”, in which the readers could find a compilation of articles, websites, video materials, photo galleries and documentaries on various topics. We invite you to take a look at the informative video materials (six short movies), in which Latvian language teachers and students share their experience of studying. The video materials do not only acquaint us with the work experience of the teachers, but also the students give their answers to the question: “How to learn a language better?” These short movies have been filmed to serve as a methodical material in a spoken form. Pedagogues talking about their experience acquaint the viewers with the methods used and allow them to take a look into their classes. At the same time it is revealed which factors have contributed to the acquisition of Latvian language and why the latter should be mastered. 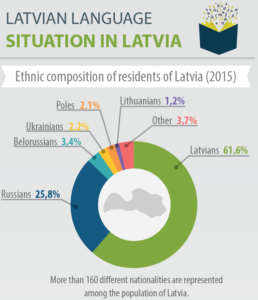 The information concerns native speakers of other languages for whom Latvian has turned into an everyday communication language and who has integrated successfully into the life in Latvia. We hope that these examples will help the beginners overwhelm their fear of learning the Latvian language. The movies have been filmed at the Latvian Language Agency, implementing the European Union Asylum, the Migration and Integration Fund for the project Latvian language acquisition in order to promote the inclusion of citizens from third countries into the labour market planned for the period 2014-2020. Special thanks go to the team of the creative agency “Tribe”. 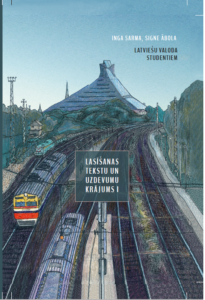 In the beginning of 2018 has been published the textbook “Lasīšanas tekstu un uzdevumu krājums” prepared by the Latvian Language Agency. The collection of reading comprehension texts and exercises has been created as an addition to the schoolbook „Latviešu valoda studentiem”, so that it could improve the students’ literacy in Latvian as a foreign language, as well as their ability to perceive and use a text according to the situation. The texts and the exercises in the study tool vary according to their type, length and complexity. They strengthen and broaden the students’ vocabulary, develop their reading comprehension skills and their ability to perceive information in Latvian language. Moreover, they increase one’s linguistic competence. For their part, the illustrations inserted will help the students to perceive certain objects or processes in a visual way. 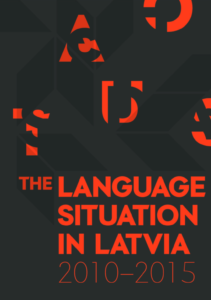 This study analyzes the dynamics of the language situation between 2010 and 2015, discussing the language proficiency and language use of Latvia’s residents in various sociolinguistic domains, the existing proficiency of various languages in society, and the position of these languages within the linguistic environment. Other topics discussed include the events significant to the implementation of language policy that occurred during this period and the language situation in the Latvian diaspora. At the end of each chapter, there is a summary of the main conclusions and recommendations for implementing language policy in the future. In this study, as in the study published by LVA analyzing the previous period (2004-2010), there is discussion of the development and events which have occurred for the two communities mentioned in the State Language Law and which are significant in Latvia’s cultural history and linguistic environment. These are the spoken and written forms of the Latgalian variety of Latvian and the indigenous Livonian language. This study is based on quantitative as well as qualitative survey results, which are analyzed in the context of the newest theories and insights offered by the global sociolinguistic community. This study will be useful to all organizations involved in implementing language policy, to linguists, to students of sociology and history as well as to university lecturers. At the end of this volume, a broad collection of literature and sources used in this study is provided. The goal of this is to inspire the reader to independent research and further study. A sociolinguistic study. Scientific Editor: L. Lauze. Editor-in-Chief: G. Kļava. Rīga: LVA, 2017. 272 pgs. For the third year, the University of Latvia in collaboration with the Latvian Language Agency organizes “Summer School of Latvian Language and Culture” for students and other interested parties who want not only to learn and improve their Latvian language skills, but also to expand their knowledge of Latvian history, art and folklore. The students who study the Latvian Language or other Baltic languages at their home universities are particularly encouraged to apply. a two-day trip to port city Ventspils, sightseeing (e.g., the Seaside Open-air Museum with an opportunity to ride a narrow-gauge train Mazbānītis, Ventspils Crafts House, a boat tour aboard “Duke Jacob” (Hercogs Jēkabs) along the Venta River). The attendees, having successfully completed the course, are awarded 4 credits (6 ECTS). 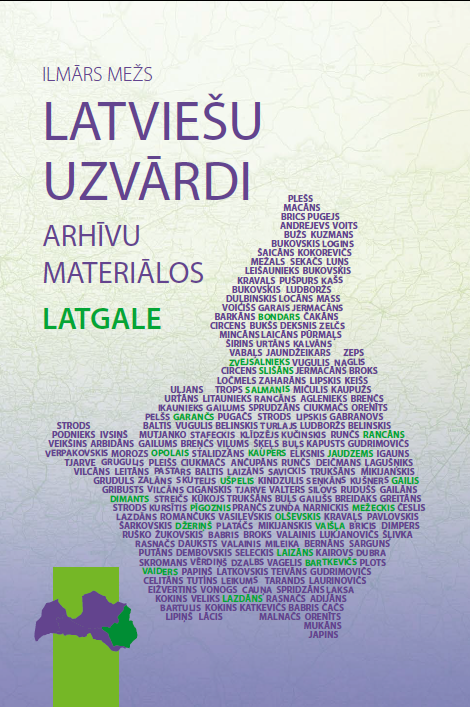 The Latvian Language Agency has published a short dictionary about the origin of Latvian geographical names “No Abavas līdz Zilupei. Vietvārdu cilmes īsā vārdnīca = From Abava to Zilupe. The origin of Latvian geographical names. A short dictionary” (Riga : LVA, 2015. 304 pp.). 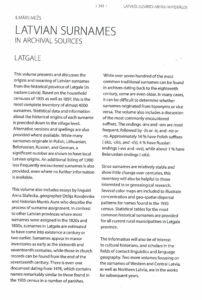 In this book information has been compiled about the origins of more than a hundred of the best-known Latvian place names by the authors ((Dr. Laimute Balode and Dr. Ojārs Bušs). The dictionary contains information about the origin of the names of all Latvian cities as well as some bigger or better-known villages. From the names given for hills, rivers, lakes and other geographical points only some widely known examples are discussed. Authors have also not forgotten about the name of the country ‘Latvija’ (Latvia), the name of the Baltic Sea ‘Baltijas jūra’ and the names of the five cultural and historical Latvian regions. The bilingual book contains information in Latvian as well as in English. It can be bought in the Latvian Language Agency. Summer school of Latvian language! © 2019 The Latvian Language Agency. All rights reserved.